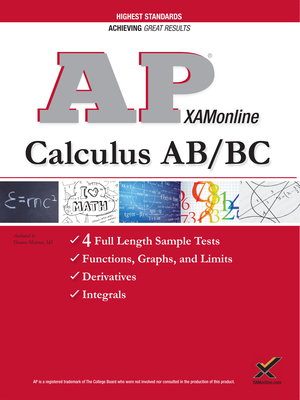 Chances are you are interested in these two tests, AP Calculus AB and AP Calculus BC. XAMonline combined them into one book so you can save money and time. This product has four sample tests, two for each exam plus a mini course that gets you last minute test drive for the test. The full study guide is organized with each Big Idea in mind, essential knowledge explained, enduring understandings and learning objective examples. No other study guide gets this granular. This organizational structure Dr. Thomas Mattson, graduate from RPI, gives you 450 pages of practice. You can go directly to any of the four chapters and review in any order you feel best helps you to fill your personal gaps in knowledge.